Theatre and cinema, built 1936, replacing a former theatre on the site (opened 1879). Also known as "Politeama Argentino". Demolished in 1958 in favour of a planned building complex "Torre Politeama" that was never actually built. 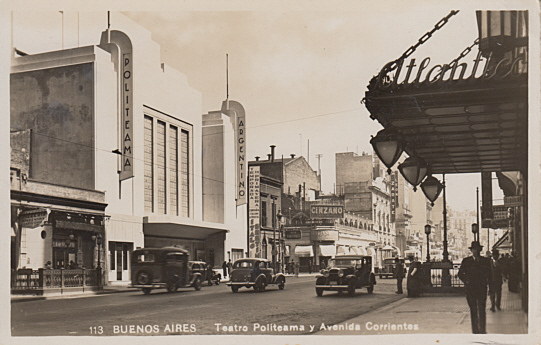 Front Text: "Buenos Aires, Teatro Politeama y Avenida Corrientes", inscription on left building: "Politeama Argentino"